Yes, you heard that right! 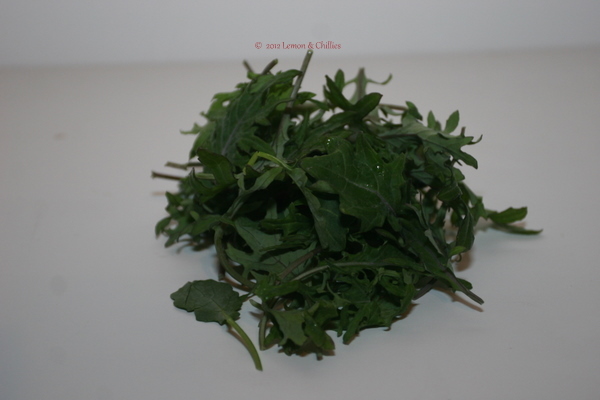 Kale can be made into awesome crisps and if you have not tried them so far, you should right away and I swear, you will be addicted to it. 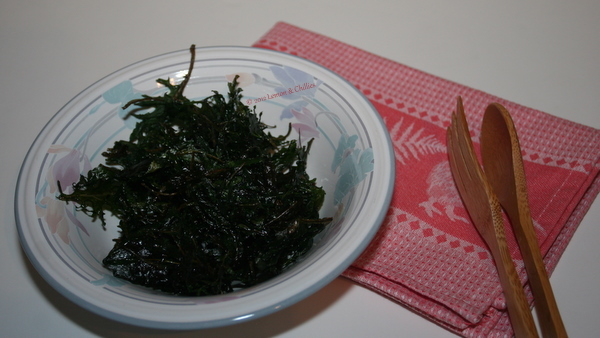 I didn’t know that crispy Kale was all the rage, till K told me about it, after having tried it in his cafeteria. I tried it too and loved it. In my head, I went – “Well, it is crispy which means in all probability it is fried and anything that is fried tastes good” and right then, as if he was reading my thoughts, K interjected with a “You know, they are actually baked” quip. I had not the least clue as to how to make this but figured as always, Google will be my partner in crime. When I read the many links and the recipes, to say that I was surprised will be an under-statement. I never imagined that this will be so simple to make. Believe me, it takes all of 10 mins from start to finish and that includes about 7 mins of baking time. Go figure! Set the temperature in the oven to 350 F.
Toss the Kale leaves with EVOO (just make sure that leaves are fairly well-coated in oil. You can use more or less based how big or small your hands are 🙂 ). Spread it on a baking tray and bake for about 5-7 mins till the leaves look crispy but have’t started to brown (they should remain bright green). I didn’t season this with anything and we loved it as is. You can season it with salt and/or red chilli flakes, if you prefer. 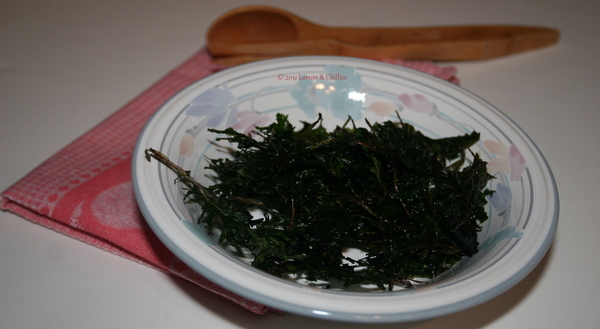 You can also add minced garlic to the Kale while baking. I am sure it will taste equally delicious, however you chose to flavor it. A healthy dish that can’t get easier to make and tastier than this. Enjoy! First off, wish you all a very good new year. I don’t think I can think of a better first post/recipe than the amazing Dahi bhalla. I am not sure how many of you have heard of Dahi bhalla, but I didn’t know of its existence till the new year’s eve of 2012 🙂 A few friends planned to meet and decided on a chaat-themed potluck. Pav-Bhaaji and Pani-Puri were taken and I was wondering what to make; was trying to decide between Aloo tiki-chole and Bhel puri when Google led me to Dahi vada and then, *drumroll*, Dahi bhalla. Now, I know Dahi vada, hindi for Thayir vadai (as far as I know). But, Dahi bhalla? Well, Google again came to my rescue – turns out that the main difference between the two is in the dahi; while for Dahi vada the curd is, well, just sour with some spices for Dahi bhalla the curd is sweet, almost like a lassi. 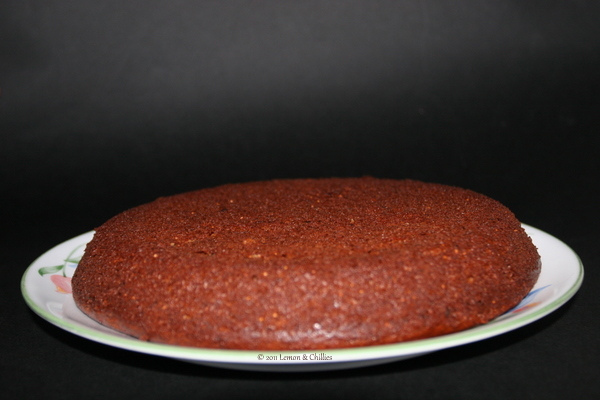 I followed the recipe at Vahrehvah with some minor modifications and result was lip-smacking. The first step in the preparation of Dahi bhallas is making the Bhallas. Making Bhalla is similar to making Vadai. Soak urad dhal and green chillies in about 1.5 to 2 cups of water for a few hours (overnight is best, but I soaked it only for ~4 hrs and it did not notice any difference). Grind this to a thick paste adding as little water as possible. Add salt to this mix and beat this mix well with a spoon to aerate the mixture. I picked this tip from the Vahrehvah chef and the Vadas (or Bhallas :)) turned out soft and fluffy. Boil potato; peel the skin and mash it well. Mix this with the aerated urad dhal mixture. This is the dough for Dahi bhalla. 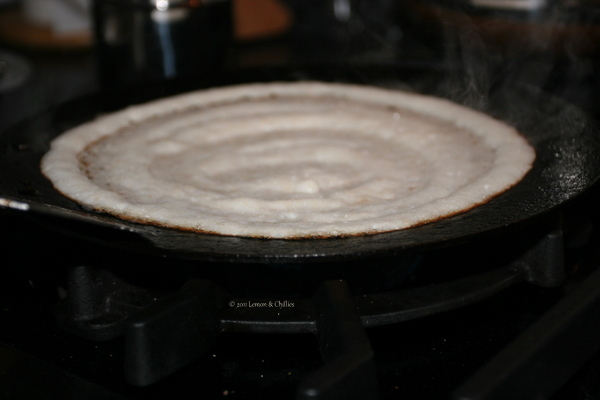 Note: Instead of deep-frying the Bhallas, I used my Appam pan (looks similar to this). I picked this tip from the jugalbandits a while back; in addition to other benefits listed in the post, I noticed that it was less messy and resulted in uniform Bhallas. To make the Bhallas, take a bit of the dough in your hand and make a rough ball with it. Now with your thumb, make a shallow hole. Place a piece of cashew and raisin in this hole and close it. Stuffing the Bhallas with cashew & raisin is purely optional, but I would highly recommend this as biting into a cashew/raisin as you are eating the Bhallas takes the taste and the experience to another level. 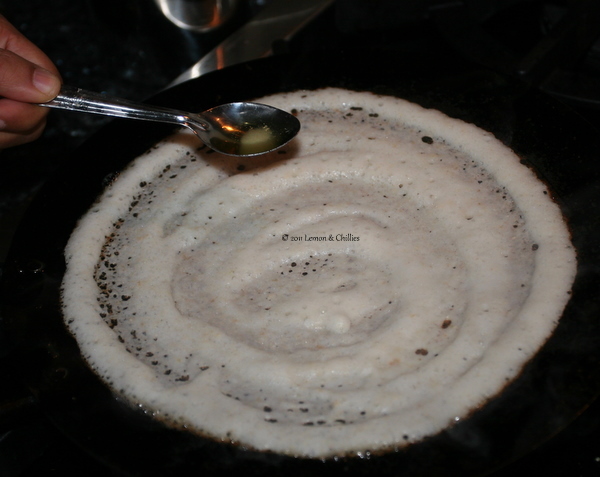 Add oil to the pan, about a tsp or so in each hole, Place the bhallas and cook both sides by turning them. 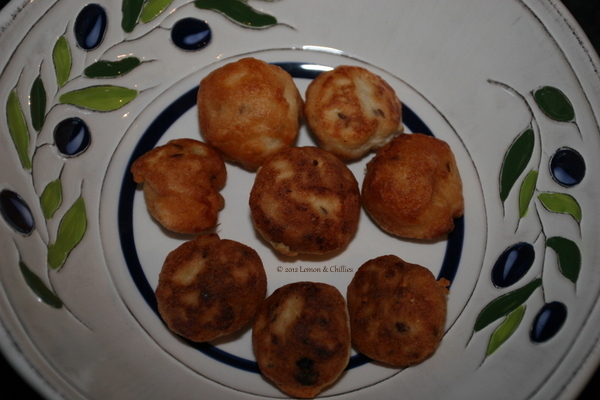 Use up all the dough and finish making the bhallas. The yield for 1 cup of urad dhal was about 60 and I guess the number depends on the size/shape of the Bhallas that you make. If you are not a dahi (curd) fan, you can stop at this point and enjoy the Bhallas with a cup of tea and/or mint & tamarind chutney. K can vouch for that 🙂 Of course, to kick it up a notch, you need to turn them into awesome Dahi bhallas. Add water to a deep pan and bring it to a boil. Add the Bhallas in batches to the boiling water, leaving it in for a couple of minutes; take it out and with a napkin press on it gently to squeeze out as much water as you can. Once soaked in hot water the Bhallas become soft and absorbs dahi faster. Whisk the curd with sugar (add a little water if it is too thick) and keep it ready. In a wide bottomed container, make a bed with boondi. 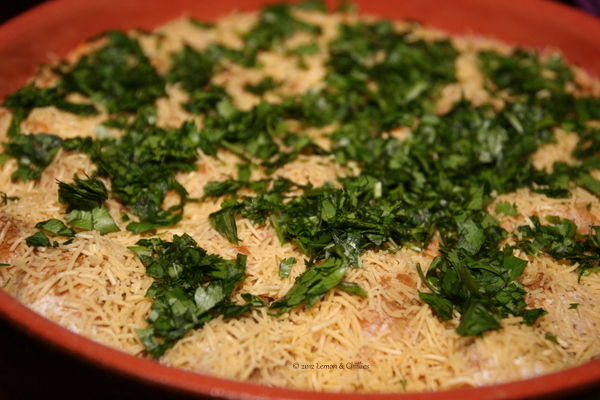 Place the Bhallas (soaked and squeezed) over this as a single layer. Now pour the sweetened curd and make sure to cover the Bhallas. Use more curd, if need be. 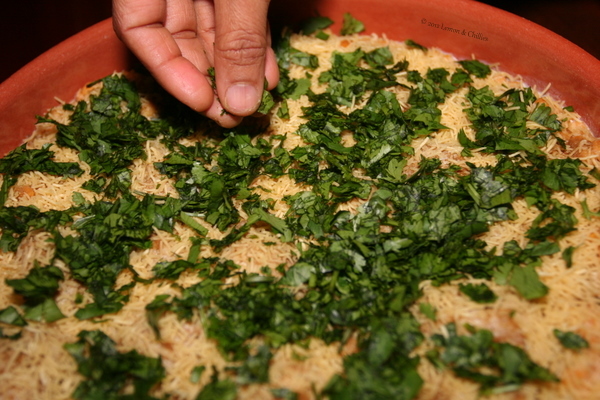 Sprinkle the coriander, cumin powders on top as well as the chaat masala. 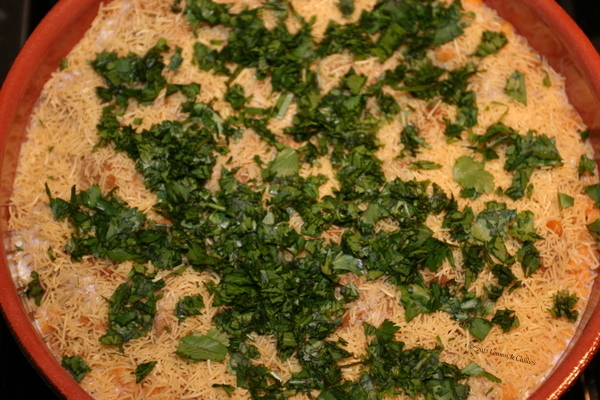 Complete the garnish with sev and coriander leaves. But not the Christmas cake. 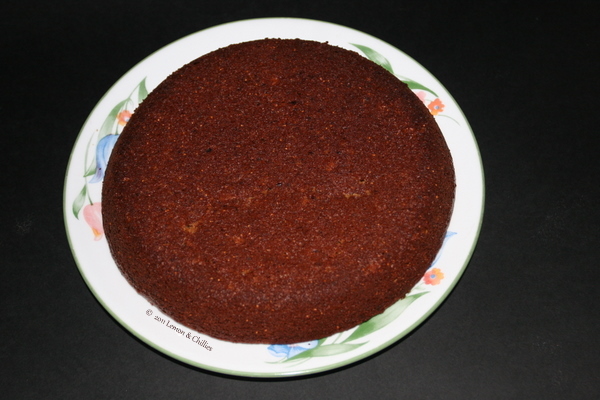 I know it is not fair to post a fruit cake recipe as a teaser around this season. But I made this cake a few days back and it was almost as good as a Christmas cake and since I didn’t get to bake a good Christmas cake this season, this one will have to do. I heard about this recipe at a potluck dinner a few days back and a quick Google search landed me here which was an exact match to what I was looking for. Ideally, soak dried figs overnight in warm milk (gives a richer taste than plain water). If you forget to soak, don’t fret and soak it in slightly hot milk for about an hour. Grind it to a fine paste along with the milk. Use only as much milk as required as the paste should not be too runny. Mix this paste with condensed milk and keep it aside. This is your wet ingredient. 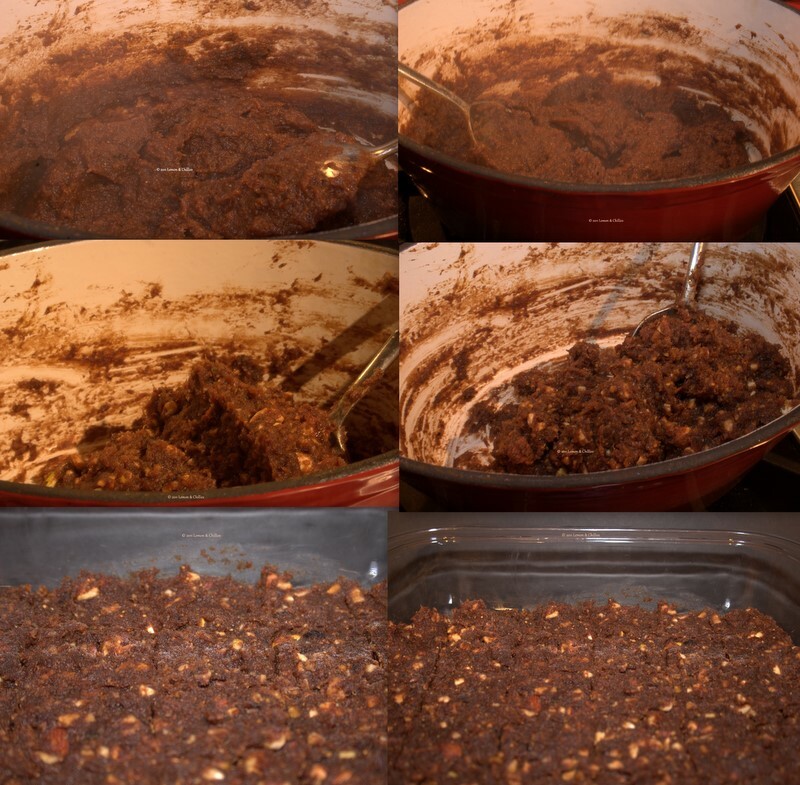 Pre-heat your oven to 350 F.
Sieve and mix the dry ingredients including nuts together, as you normally do while baking. Cream the butter after bringing it to room temperature and add the dry/wet ingredients alternatively in batches incorporating it all together. Bake for about 30 mins; test to see if an inserted tooth pick comes clean and bake more, if need be. Dear Shy, Merry Christmas and this is for you. The figs add a nutty taste and go very well with walnut. Given that it uses a can of condensed milk, I was worried if it will be overtly sweet but it was not. You can of course, add different nuts and even candied fruits to it to make it richer. 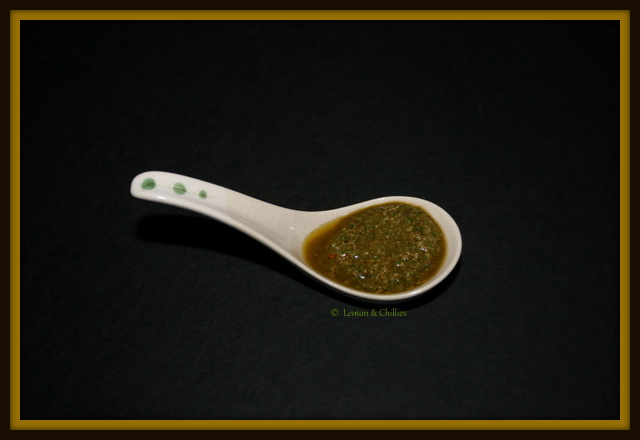 Pesto is one of the easiest sauces to make but I haven’t made it in over 3 years! I had planted Basil in the summer and after a big harvest just before fall, was left with cup-loads of the leaves. After using them in salads, soups and what not, I realized it was time to make pesto. I pretty much used the same recipe that I did last time using Basil instead of Coriander and the result was equally yummy. 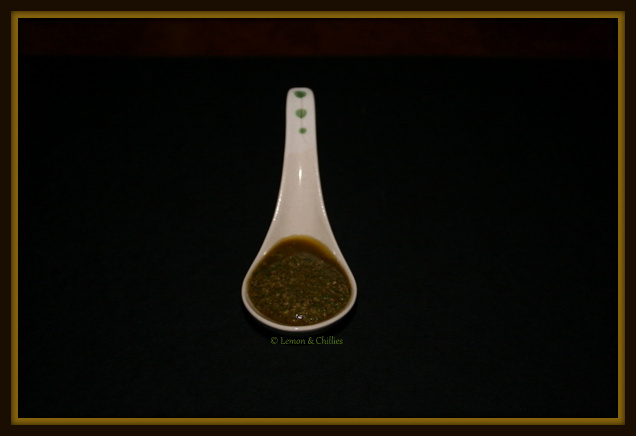 This can be used not just as a pasta sauce, but also as a dip or even as a dressing for salad. Enjoy! My love affair with dried fruits and nuts started when I tasted the dried fruit and nut milk-shake at a restaurant (which I vaguely remember was called Mac) on MG Road in Bangalore. This shake was fit enough to be a meal both in taste and satiation. I remember drooling over this shake and although I have had this shake several times after that at many different places (including chez moi) none measured up to the lofty standard set by the original one. Anyway, I digressed and this post, although is about dried fruits and nuts, is definitely not about shakes but about halwas – the ubiquitous dessert found in almost all cultures and cuisines. Of course, in India, we make halwa with everything ranging from moong dhal to wheat to carrot/potato to pumpkin – looks like we are capable of turning everything to a halwa. “When in doubt, turn it to a halwa” should be a national tagline! 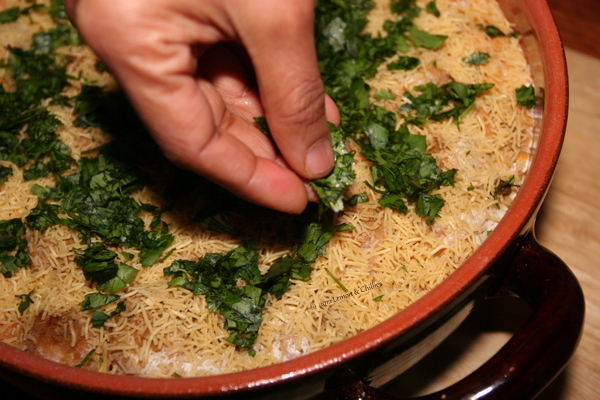 The base template for all halwas is the same – basically, throw in the ingredients in a heavy-bottomed vessel, cook it over low-medium flame for about 30-45 minutes and slowly, in front of your eyes, what was a sticky-icky blob turn will turn into a still lumpy ball that importantly, moves easily when guided with the spoon leaving the sides of the vessel. Start with about 20 pieces of figs and dates soaked over-night in a cup of warm milk. Blend it into a find paste with the milk that was used for soaking. Add this to a thick-bottomed vessel (I used the cast-iron pot from here) and cook it in a low to medium flame with a tsp of butter. While the mixture is cooking, coat a clean plate with a tsp of butter and keep it aside. After about 30-40 minutes of slow cooking, during which time it needs very little attention except for the occasional stir to make sure the mixture cooks evenly, add the chopped nuts and cook for a couple of more minutes making sure the nuts are mixed and incorporated well. Turn the stove off and transfer the mixture to the butter-coated plate. Let sit for a few minutes and then cut it in diamond-shaped pieces. The dried fruit halwa was inspired by Soma’s version here, after I drooled many days over those pictures.